This summer, I thought of making ice popsicles/candies/lollies in a very simple way which would involve the minimum amount of time & effort. The easiest way is to use ready fruit juices available in tetra packs & bottles. While I was shopping in the supermarkets I came across Real Plum Juice & Pomegrate Juice & thought of using it to beat the heat by making ice popsicles. 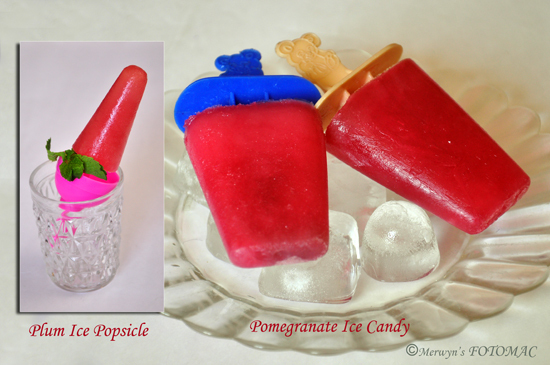 I filled the juice in popsicle moulds & VOILA!!! …. within a few hours we were enjoying these lovely frozen colorful ice lollies/popsicles. It was so refreshing ! This is a great activity for children this summer to keep them busy with some creativity. They will surely be proud of making their own favorite ice candy.